Silver & black case. 1120W Powersupply. Includes: Keyboard & Mouse. 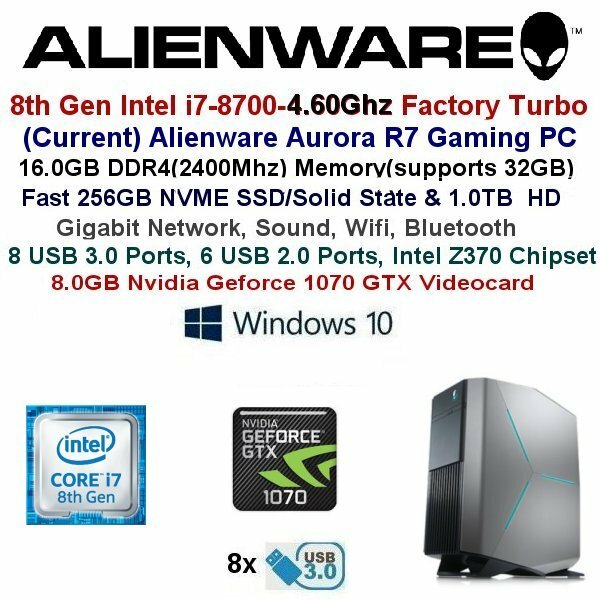 Legendary Alienware Aurora R5 Gaming desktop engineered with 8th Gen i7 IntelÂ® Coreâ¢ processor, VR-ready graphics and a striking design built for optimal cooling and powerful performance.8th Gen Intel Hexa Core processor deliver exceptional performance and headroom for split-second responsiveness and powerful multitasking capabilities. VR-ready graphics: Designed for performance and expandability, .Better boot time: High capacity SSD hard drive options for faster boot and load times on games & multi-media applications. Includes 1 processor, supports up to 1 Processor, 6 Cores - 12 Threads in Window 7/8/10, and available for Virtualization.